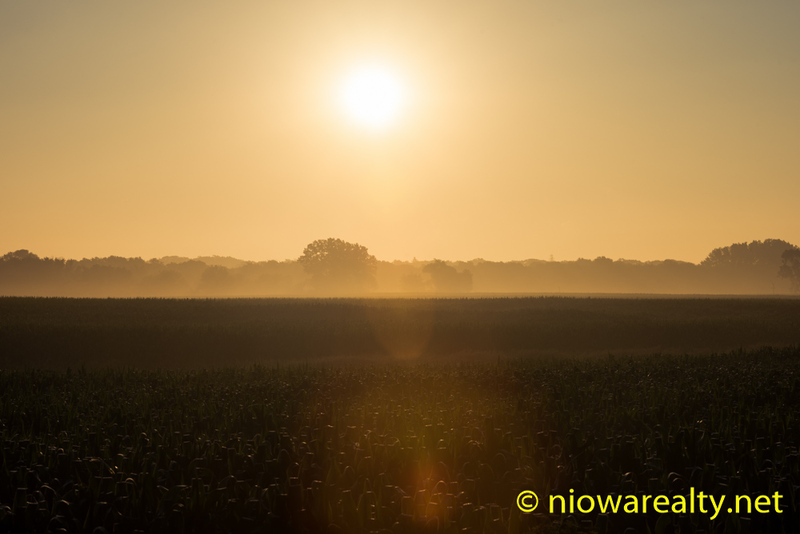 Share the post "The Mists of Early Morning"
Getting off to another early start this morning, I noticed how the traffic returned to normal after the long weekend. I thought it a bit strange to find the Downtown not as busy as normal yesterday especially when we had a three day weekend. Perhaps there were many who took Tuesday off as well. Oh how relieved I was to find it beginning to rain last night which helped bring the temperatures down. There must have been more wind than I was hearing outside due to the number of tree branches down in and around the City. Those Locust trees that were planted as part of the Streetscape project were not what I’d have chosen due to their weakness to the wind, and it does blow Downtown even more so because of the wind tunnels that are created by the tall buildings. As those Locust trees get bigger, their extended branches will be the ones to suffer from the wind. Oh well, they were planted and are now growing so we must leave them to do their job of being part of the planned Streetscape. A late morning appointment took me to a home I’d looked at some months ago and the owners wanted me to spend some time going through the home and tell them what the most important things needed to be done to help get the home sold quickly. I was there for over an hour and before I left I assured them it would sell relatively quick as long as they did what I asked. It’s got a good floor plan along with some expensive updates, but the biggest selling point is that it’s in a popular neighborhood. The buyers are still out there, but they’re becoming all the more savvy when doing their comparative looking. Listings of mine are continuing to sell and I’m happy about it—especially knowing we’re approaching our normal “quiet time” of sales. Last night I was up for watching a movie which one of my clients had encouraged me to see some years ago. I figured it was better late than never so last night was my first viewing of it. It’s a very good movie, but I can assure nearly everyone that after seeing it in its entirety and knowing it was based on a true story, you’ll be very angry at every person responsible for either turning their heads away from, or being involved in human trafficking. I didn’t get my normal rest last night just because I couldn’t keep myself from thinking about it. I’ve seen documentaries regarding it, but to have someone tell their true story in a more dramatic way, really went to my core. I would encourage everyone who hasn’t seen it to get it and see for yourselves. The name of the movie is The Whistleblower. Several days ago I had to make a quick early morning trip to pick up a sold sign that I’d forgotten. Since we’ve been having light ground fog, I noticed an absolutely beautiful sight as I came up over a hill. Luckily I had my camera with me and snapped the above photo. What I like so much about it is the almost Medieval feel of the landscape. With the mist blocking the view of houses and farms, the landscaped appeared barren of human life. I was again thankful for having the opportunity to live in North Iowa and experience the hidden beauties that sometimes appear to us just over a hill. I had a very good day that day after having experienced the mists of early morning during the Summer of 2016. Be sure to keep a lookout for your own visual treasures.